Temporarily out of stock, will ship within 3 to 5 days. The RIDGID K-5208 is the most powerful and compact sectional drain cleaner on the market. 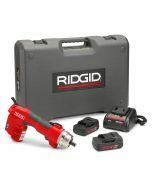 Power meets portability as this machine is 35% lighter and 71% smaller than previous RIDGID sectional drain cleaners. Clear 2 inch to 8 inch drain lines faster and cleaner with the K-5208. The most powerful and compact sectional drain cleaner on the market. Tool-less clutch adjustment to quickly switch between cable sizes. Efficient in-field clutch serviceability to minimize down time when maintenance is needed. Innovative fluid management for a cleaner work environment. Square steel tubing for enhanced strength and durability. Quick-dump cord management for a quicker start-up. Sectional cable carrier improves loading and unloading cables while delivering a cleaner solution. Trident Sectional Cable Decoupler speeds up the process of disconnecting cables. Ridgid 61693 K-5208 Sectional Drain Cleaner See Price in Cart - For the Lowest Price online!